THEY ARE THE FACES, the hands, the feet, the voices of a new Faribault. Not the community of only French or Germans, Scandinavians or whatever ethnic groups shaped and defined this southeastern Minnesota city for so many years. I can’t possibly attempt to summarize the contents of that report here. But it is packed with information that should be a must-read for every member of my community. We can all learn a thing or two or ten or 20 from this research project. 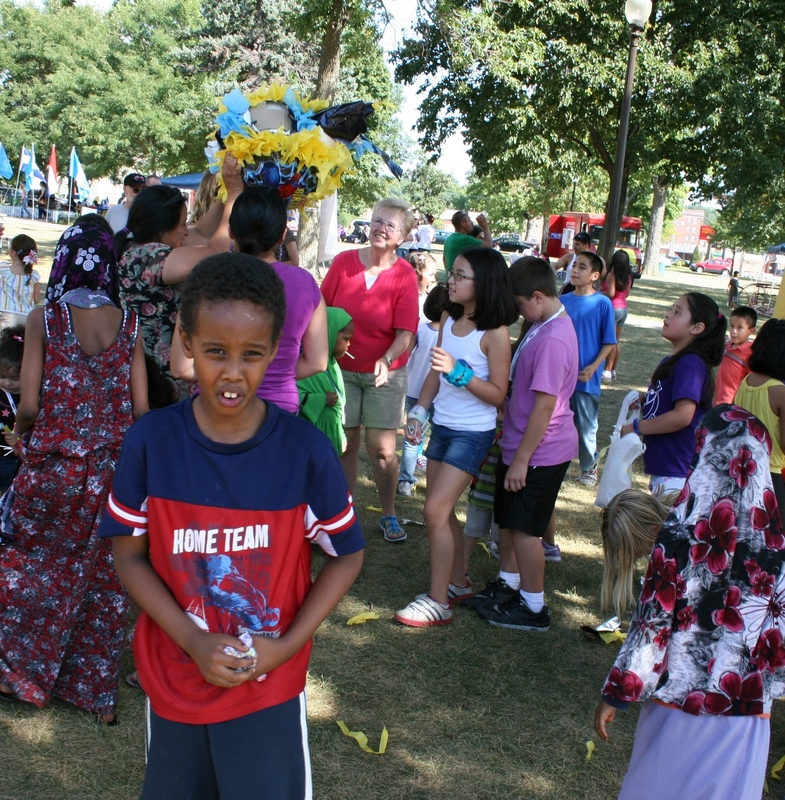 But mostly we can learn from meeting our neighbors at events like the International Festival held Saturday in Faribault’s Central Park. I’ve attended this meld of ethnic cultures several times already and each time enjoyed interacting with my neighbors whose skin color differs from my own. That all sounds nice, politically-correct, and exactly what you’d expect me to write in a public venue like this blog. But I am sincere in my appreciation to the volunteer organizers of the International Festival and to those who participate. We just need more Caucasians to attend. 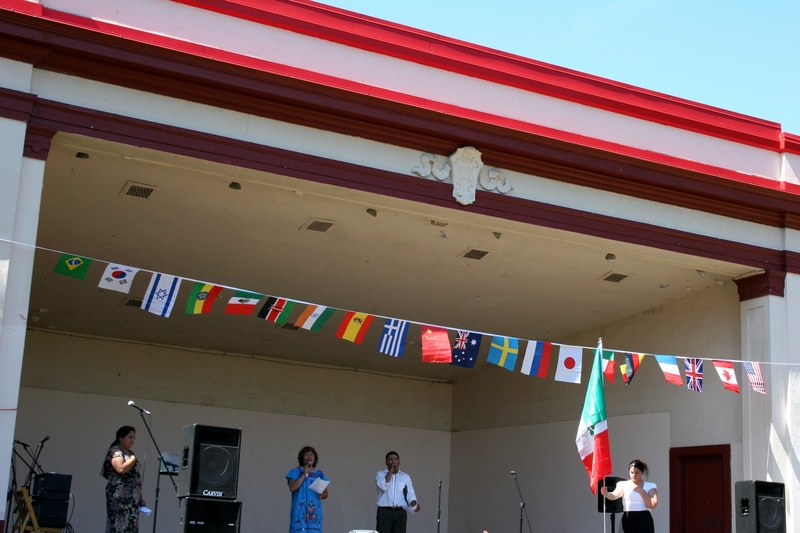 Several Latinos lead in singing of Mexico's national anthem on the band shell stage. From the food and merchandise vendors to the musicians and everyone in between, I had ample opportunity to educate myself about Mexico, El Salvador, Guatemala, Honduras, Somalia, Holland and Norway. My husband and I sampled ethnic foods from five vendors. 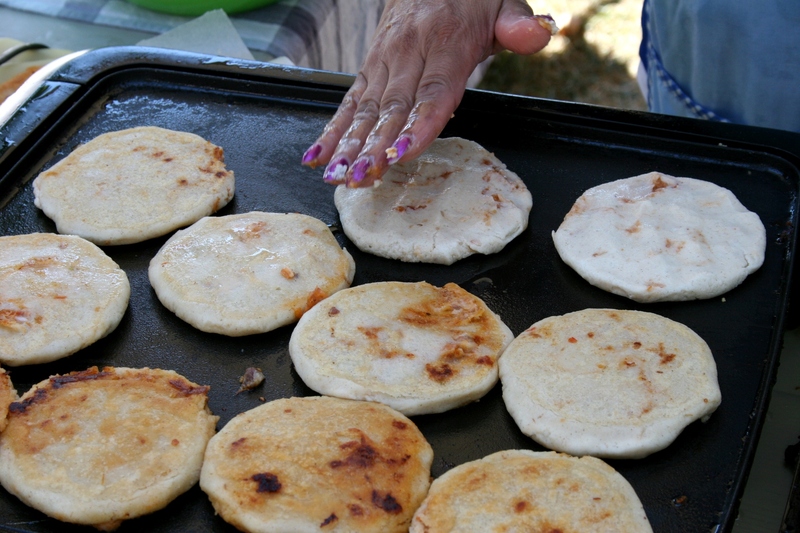 We sampled pupusas right off the griddle. 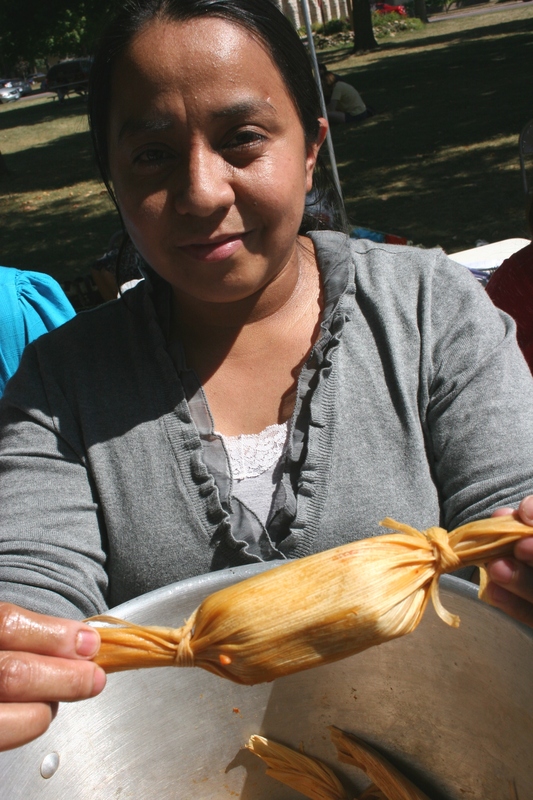 My husband and I tried Guatemalan chuchitos-- chicken, corn and salsa wrapped in a corn husk. For me that mingling was most evident when children gathered under shade trees just south of the Central Park band shell to break piñatas. It didn’t matter if their skin was the beautiful color of sun-baked clay, or a nearly-black deep brown, or pale white. They were all kids, just kids, waiting to whack that swaying treasure-trove apart and then scramble for candy. After the pinata was broken, the kids shared the candy. While waiting for the piñata busting, I made a point of scanning the adult faces. 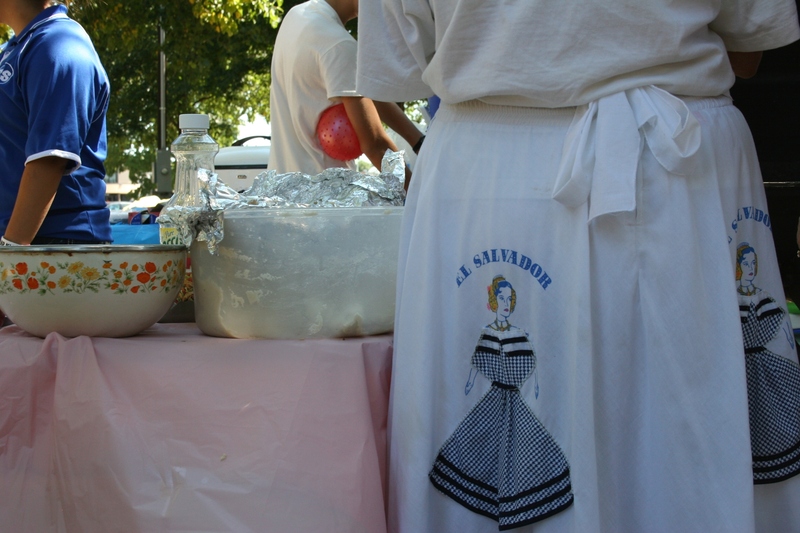 I saw smiles—smiles nearly as wide as the brimmed hat worn by the man donning an El Salvador T-shirt. That’s an exaggeration, but you get my point. Viewing kids having fun has no color barriers. 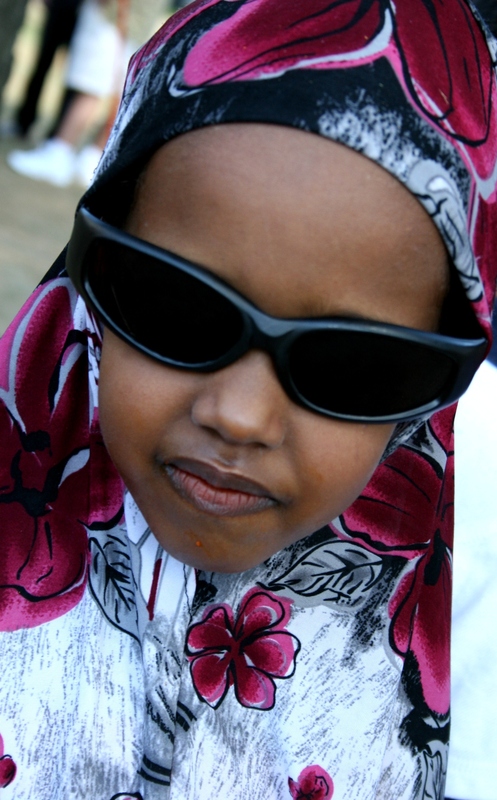 She told me how the angry voice of a single white student, who declared, “Somalis don’t belong here,” triggered those racial tensions. As she spoke, her voice became more agitated, edged with emotion. I wanted to reach across the table and hug her and I wish now that I had. 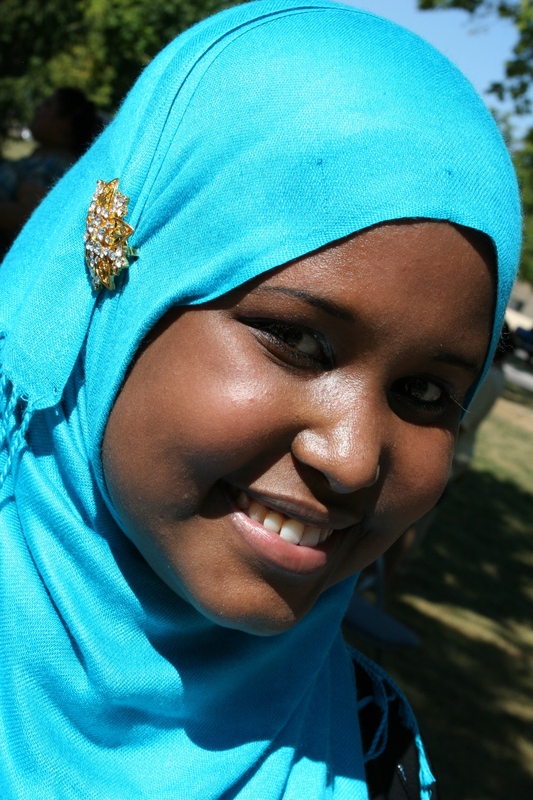 But I didn’t and it is too late for that now, but not too late to encourage Faribault residents to make the effort to meet the Somalis, the Sudanese, the Latinos and other immigrants who now live among us. It is easy to dismiss and stereotype an ethnic group if you’ve never made the effort to personally meet them individually. 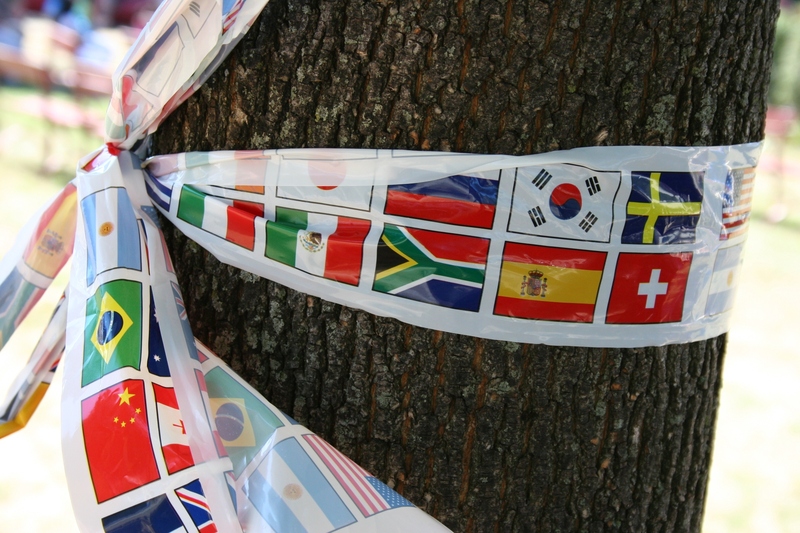 National flag ribbons were tied to trees in Central Park during the celebration. Vendors peddled their wares at the festival. 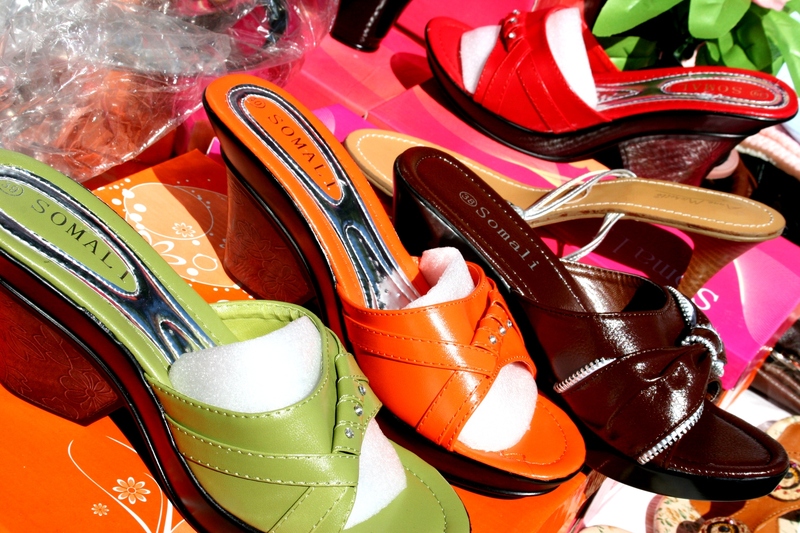 Shoes from Somalia on display at Riyaam's table. A woman from El Salvador cooked at her food both. Sanji, 18 months, plays with toys in the kids' activity area of the fest. 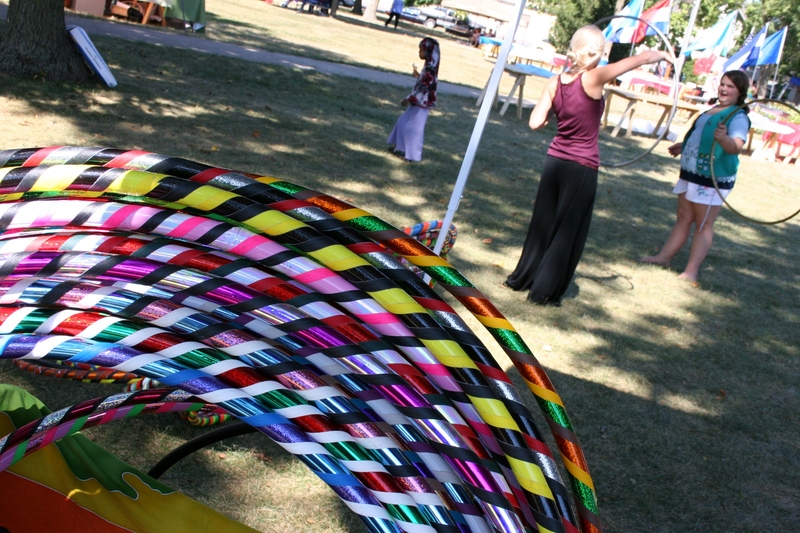 Hoop maker, performer and teacher Adrienne Lee teaches a Girl Scout the art of hoop dancing. The Girl Scouts were among the non-profit groups with booths at the festival. A young girl's henna stained foot. 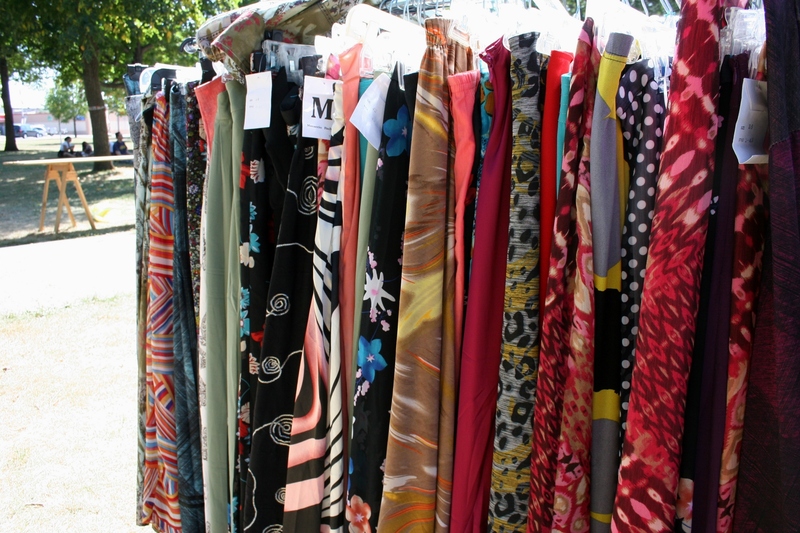 Colorful skirts for sale at Riyaam's booth. The report continues: “They do not agree about what should be done to unite these groups. 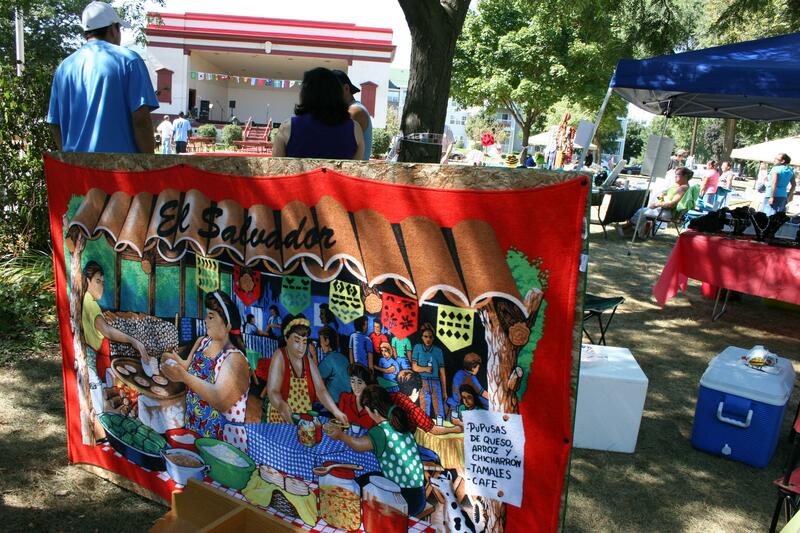 A colorful, detailed wall hanging/blanket represented El Salvador at one booth. 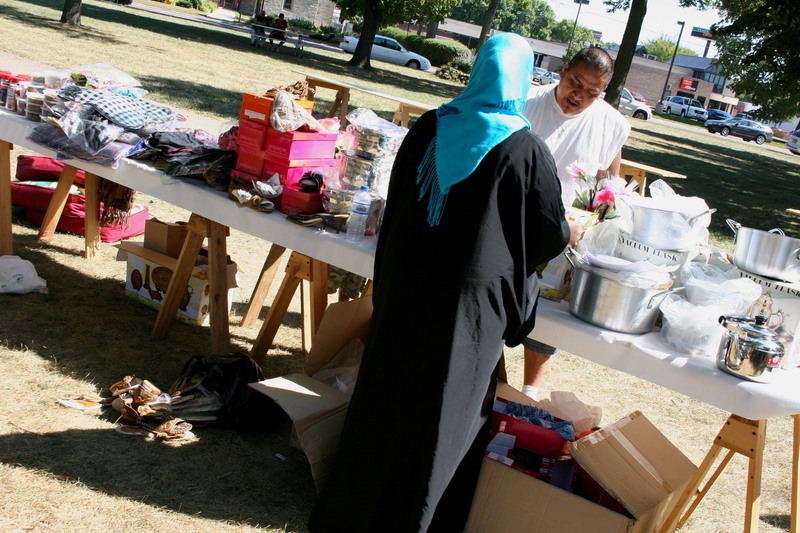 FYI: International Festival, Faribault, a recently-formed non-profit, has set its number one goal “to promote understanding of different cultures by organizing an annual event,” says Peter van Sluis. Secondly, the group wants to raise money and assist other non-profits. Absolutely, a hug next time. Fantastic story & pictures, thanks so much for doing this. I’m sorry I had to miss the event, looked really well done. Thank you, Milo. The event was well done. This year’s organizers had your and previous organizers’ footprints to follow. Thank you so much for covering this event! This is a real nice write-up. We are quite pleased that with only 6 weeks of planning we were able to get this together. 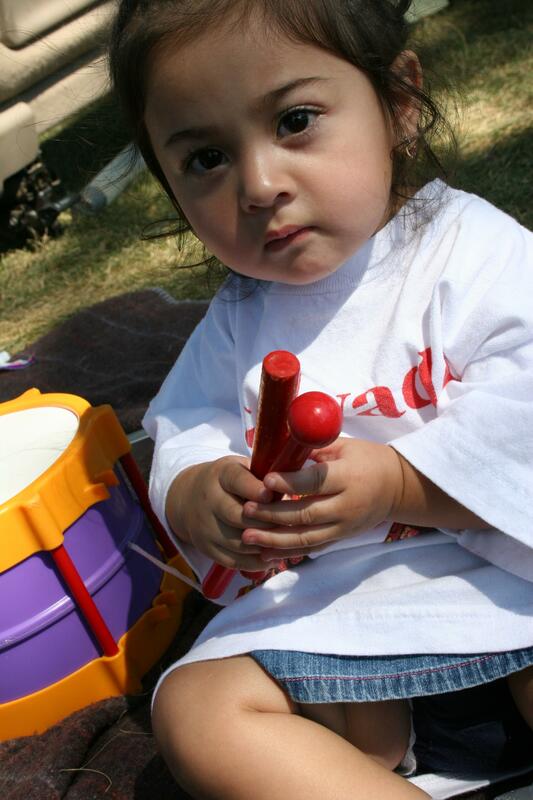 Of course with the help of Milo Larsen, Vicky Carrillo, and many sponsors from the community. We are having a de-brief meeting this week, and then we will have regular meetings in order to plan for next year’s event. With what we learned and the feedback from you and the community we will be able to be even more successful next year.